Time: 7th November from 11:30 a.m to 1:30 p.m. The depths of India’s relations with the Netherlands often remain unnoticed in modern times by people in both countries. From the sixteenth century to the earlier part of the nineteenth, however, there had been much exchange that had far-reaching impact on shaping the economies and culture of both countries. The numerous Indian objects found in the Rijksmuseum in Amsterdam or the Bengali words for the suits of playing cards (Ruiten, Harten and Schoppen in Dutch) arecases in point. In an attempt to rediscover this rich heritage, the Embassy of the Netherlands, in collaboration with Indian partners, is encouraging research as well as physical restoration of buildings, records and archival material. 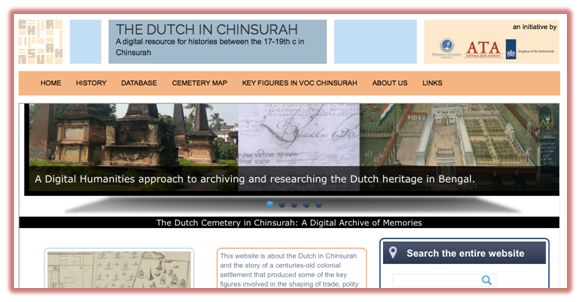 As part of this larger project, Bauke van der Pol’s new book The Dutch East India Company in India and Presidency University’s Digital Humanities Research Group’s digital database on the ‘Dutch Cemetery in Chinsurah’ have opened up new possibilities of exploring this shared heritage. The database is fully searchable and contains information such as short biographies, headstone inscriptions, architectural information, geo-tagging, hyperlinks to relevant information available elsewhere both online and offline. It also has Advanced Search options based on customisable parameters. Funded by the Embassy of The Netherlands, the project has been completed with the help of students, web-developers and faculty members of Presidency University under the supervision of Dr Souvik Mukherjee. While such databases form the very bedrock of current research on the Medieval, Early-Modern, Victorian and later periods in the USA and Europe, this project is, arguably, the first such venture in exploring the rich colonial heritage that India and Europe share. This project forms part of a larger project on Dutch Chinsurah that involves mapping and oral history. 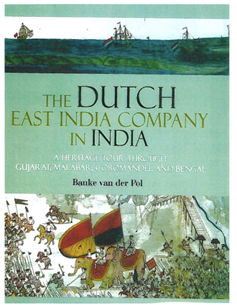 Looking at the larger picture of the Dutch in India, Dutch anthropologist, van der Pol, points out that Dutch trade relations with India have existed for far longer than those with say, America or Australia. He presents for the first time a comprehensive compendium of VOC heritage in India by guiding the reader through country houses, settlements, trading posts and cemeteries. The website and the book will be launched by the Hon’ble Vice-Chancellor of Presidency University, Professor AnuradhaLohia and the Honorary Consul of the Netherlands, MrNamit Shah. The programme will comprise the launch of the website and the demonstration of its key functionalities followed by a talk on the Dutch in India by MrBauke van der Pol.